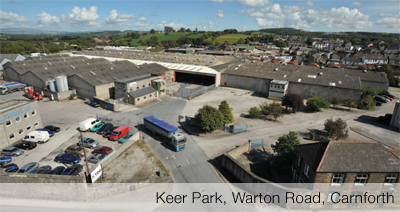 Keer Park is a former TDG distribution depot located on the fringe of Carnforth town centre and within 1 mile of Junction 35 of the M6. The site covers an area of 11.1 acres and includes over 200,000 sqft of accommodation, including warehousing and offices. Workspace Properties purchased the site in October 2012, and are looking to rent the buildings and yard space out, either in part or as a whole, to interested parties on flexible terms.